German Chancellor Dr Angela Merkel met with Sanofi bosses in Frankfurt to discuss antibiotics and open a new manufacturing facility. Merkel who is meeting with British prime minister David Cameron later today to talk about EU reform, also used the opportunity to tell reporters: “We should fight in Europe for being a strong pharmaceutical location." At the German site Merkel chatted with the French firm’s chief executive Dr Olivier Brandicourt, Boris Rhein, Hesse's minister for science and the arts, leaders of the Fraunhofer Society and researchers from Sanofi – on antibiotics research and how to foster initiatives to tackle resistance. This emerging concern has led to calls by officials and global health leaders to invest in developing new antibiotic therapies. Merkel is to host G7 Summit shortly at the beginning of June in Germany, and will be addressing that very topic. Coincidentally at the beginning of last year Sanofi and the Fraunhofer Society set up a ‘Natural Product Center of Excellence’, where scientists from Sanofi and Fraunhofer work on identifying active compounds to accelerate the R&D of new antibiotics. 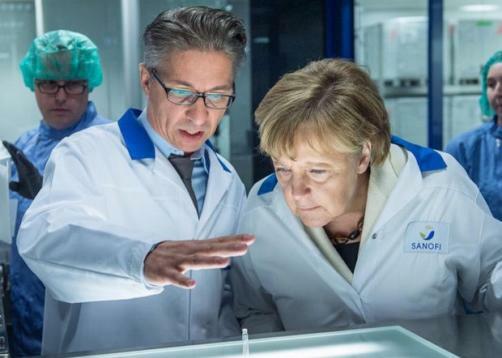 But following the discussion in Frankfurt, Merkel and Brandicourt then officially inaugurated a new, high-tech manufacturing facility that is to supply Sanofi's new insulin batches. The pharma giant says it is an ideal facility for large volume manufacturing of sterile biologics, and incorporates enough modern technology to enable Sanofi to attain high sterility standards. "Sanofi is very proud that chancellor Merkel visited our Frankfurt site, which is Sanofi's largest, integrated site," says Brandicourt. "The Chancellor interacted with research leaders from Sanofi and the Fraunhofer Society to discuss ideas for fuelling additional antibiotics research and inaugurated Sanofi's new, high-tech manufacturing facility, which is Sanofi's global production facility for its new insulin therapy for people with diabetes." Sanofi has invested more than €1 billion in technology at Frankfurt-Höchst over the past decade, and last year announced a further investment of €200 million and the creation of many new jobs – in order to expand its biologics manufacturing capacity. The firm says that in 2015 it will plough another €100 million to enhance its production capabilities.